Looking for a summer book with love, intrigue, and super powers? 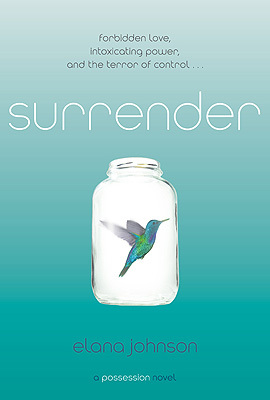 Look no further than SURRENDER by GCC member Elana Johnson, which just debuted through Simon and Schuster. As always, here’s a little bit about her book to get you hooked: Raine has always been a good girl. She lives by the rules in Freedom. After all, they are her father’s rules: He’s the Director. It’s because of him that Raine is willing to use her talent—a power so dangerous, no one else is allowed to know about it. Not even her roommate, Vi. Elana: Absolutely! A lot of the relationships my characters have with each other is based on experiences in my own life, or things I’ve witnessed in life around me. I can’t say that I’ve based entire people on someone I know, but little snippets of their personality, sure. Elana: Finding an agent. I queried two books. For the second one—POSSESSION, which was published—I sent 189 letters to agents. I had a phone call with 3 different agents before someone actually offered representation. It took 8 months and was a very hard time, what with so many rejections. Elana: I just started a new contemporary novel, and the idea came from a conversation I had with my husband about one of his students. I can’t wait to write it! Elana: I was at home, sitting in the writing cave, when the email came in. A few minutes later, I called my agent, and rejoiced that Simon & Schuster was going to publish SURRENDER. Thank you, Elana! Now, everyone go out and buy books, lots and lots of books!